"Where do potatoes grow?" That's how last week started for me. 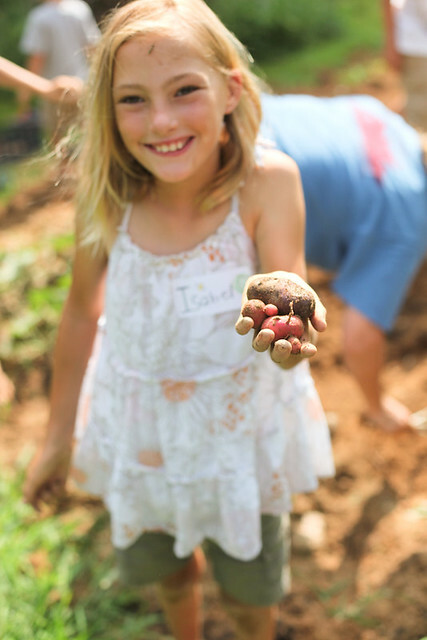 I had the opportunity to work at a kids farm to table camp, hosted by The Cook's Farm, which is run by the owners of my favorite local restaurant, Harvest on Main. 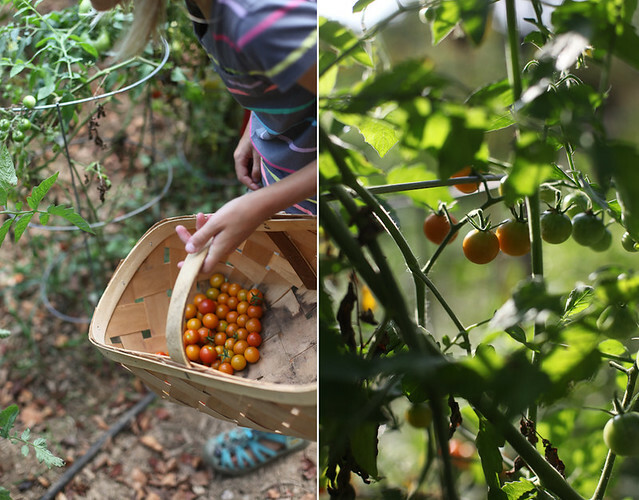 It was a week full of dirt, tomatoes, beet juice stains and smiles. 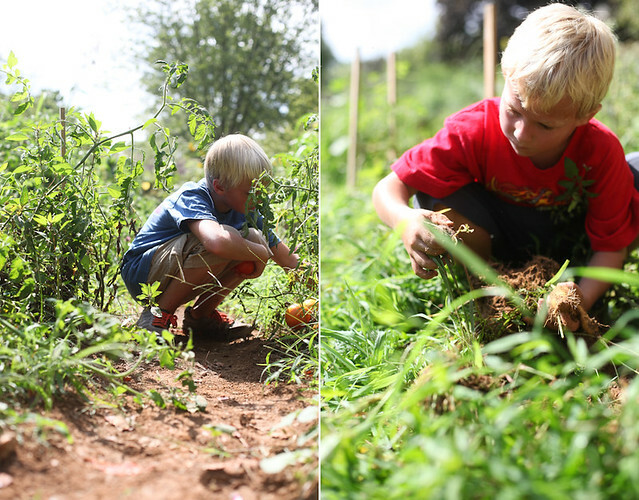 Each day, we headed down to the garden to pick what we were having for lunch that day. Potatoes, beets, corn, carrots, tomatoes, each vegetable was dug up or picked off the vine by the kids. I loosened up dirt so they could yank up carrots, smiling at the giggles when they realized a huge carrot top didn't equal a huge carrot. "This purple one, it's a carrot too? I thought they were supposed to be orange!" It is! We'd head to the kitchen, dirt on our hands, (and faces, and pants, everywhere!). The kids would scrub & peel, chop & whisk. We made potato salad, frittata with fresh eggs, tomato salad. Corn salsa, quiche, pie. Something new each day. Everything fresh from the garden. 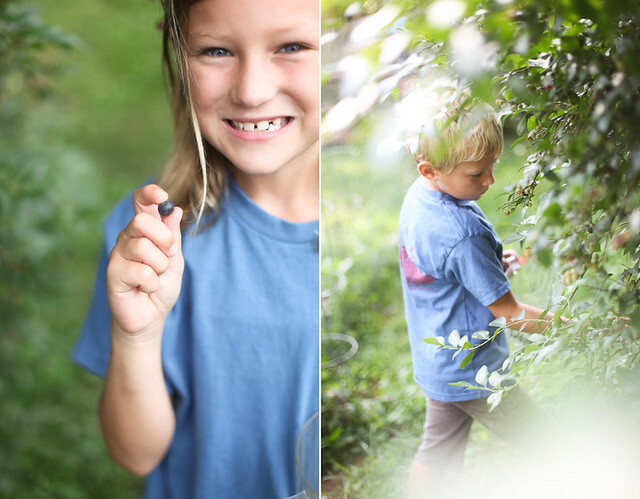 They picked blueberries for smoothies, popping more in their mouths than into their bowls. "Can we feed the chickens?" "Can we collect the eggs?!" had to be the words I heard most. They'd sit down outside the coop and feed them through the wire, holding up tomatoes so the chickens could peck. "This one is greedy!" they'd laugh. "Oh, they don't like the green tomatoes." They learned how to shoo away roosting chickens to grab warm eggs. The kids loved tasting each thing they had made & picked. The last day, the parents came for lunch. 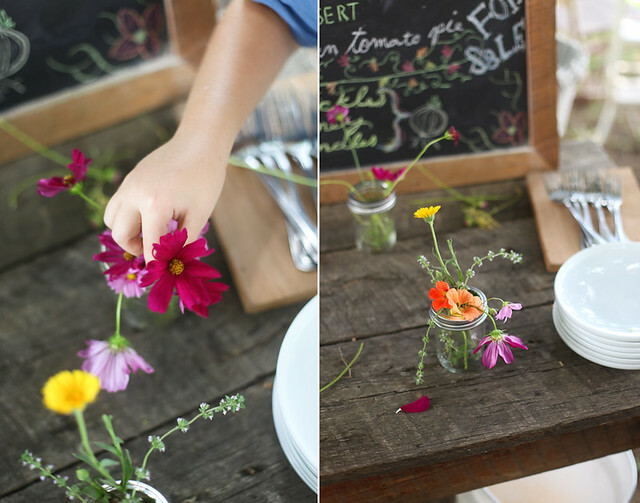 The kids picked sunflowers & cosmos from the garden, arranged them in mason jars and set the table. They took their parents on tours of the gardens and told them all about what they had learned. Then, we all enjoyed the fruits of their labor. And it was delicious! Seeing these kids so excited about food & where it comes from was inspiring. Little ones holding chickens & digging in the dirt? Bliss. This recipe is my favorite from the week - and the kids too. It tastes a bit like apple pie, but with a tang from the green tomatoes. If you can get a hold of some, it's fantastic with honey comb. If not, vanilla ice cream works well. Make the pie crust and let rest in the refrigerator for at least 30 minutes. Divide the dough in half. Place 1 piece of the dough on a lightly floured surface and roll out to an 11-inch circle, about 1/8-inch thick. Transfer to a 9-inch pie pan. Trim the crust with scissors or a sharp knife to within 1/2-inch of the outer rim. In a large bowl, mix together the brown sugar, 1/2 cup granulated sugar, flour, cinnamon, salt, and pepper. Sprinkle 2 tablespoons of the flour mixture across the bottom of the prepared piecrust. Add the tomatoes and lemon juice to the bowl with the remaining flour mixture and toss to coat. Spoon the tomato mixture into the pie shell, and dot with the butter. Placed remaining crust on top of the tomato filling and tuck the overlapping crusts into the pan, forming a thick edge. Crimp the edges to seal and cut small 1/2-inch long vents in a decorative pattern along the top crust. Sprinkle with the remaining 1/2 teaspoon of sugar. Bake 15 minutes in the preheated oven. Reduce the temperature to 350 degrees F. Continue baking for 35 to 45 minutes. these kids seem so happy! 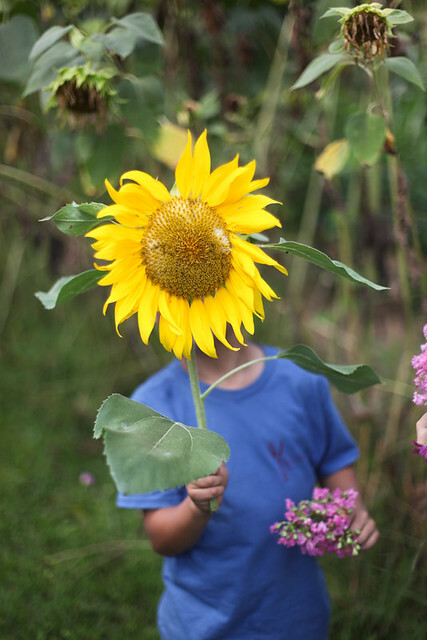 and the picture of the boy with the sunflower is gorgeous! this is so you and I love it. What a great experience for those kids. I would love to see something like this in St. Louis where I live. Beautiful! 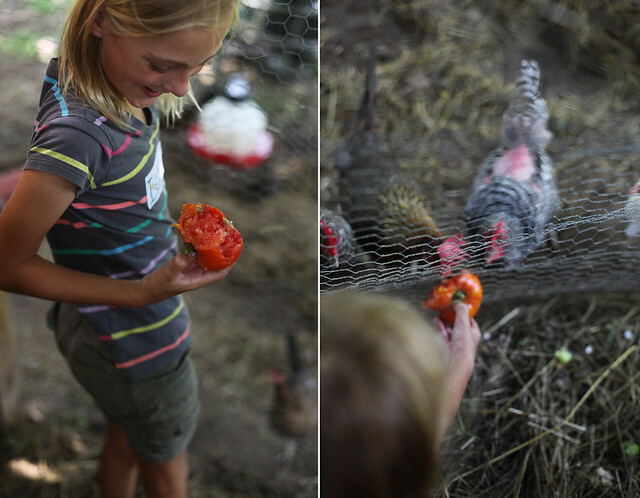 It's so great to expose kids to where their food comes from. To be honest, more adults could benefit from something like this too, haha. Such a wonderful program. That looks like a blast. And the pie looks scrumptious! 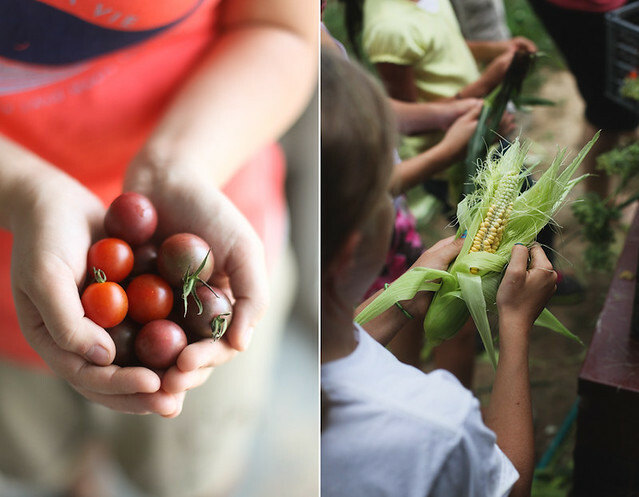 What a wonderful way to introduce kids to growing and cooking and enjoying food! Wish I knew of something similar in my area for my grandchildren. That is so wonderful! I would love to do something like that. It looks like so much fun. Awesome! I come from a farm and love this. Really thinks its good for kids who don't have country roots to get this type of experience as its eye-opening and will stick with them. Lovely photos! What a wonderful way for kids to spend a week! So great that they can both learn how to feed themselves and where their food comes, not to mention probably completely wearing themselves out with all the excitement and activity of a farm-camp! Looks amazing, so cool that you were able to participate. A farm have that kind of things, finally gives more than tomatoes, potatos, corn or milk. Stunning photos, makes me want to book a flight out of the city, and back home to the good old country! A great way to show the kids the nature. Lovely Fotos. Here in Germany I working a daycare. We have a farm behin our house. So going often there. For Children its great! I see this as a recurring theme, and I love it. I hope it spreads like wildfire. 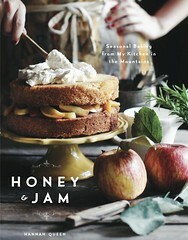 Also really looking forwad to trying this recipe. Thanks. Nice pictures! Thanks for sharing this Hannah! It was such a joy to have you and Sara working with me on this project this month. It was truly such an inspiring week for me to see we are headed in the right direction! And to have the beauty of your photographic craft following along with week was amazing! 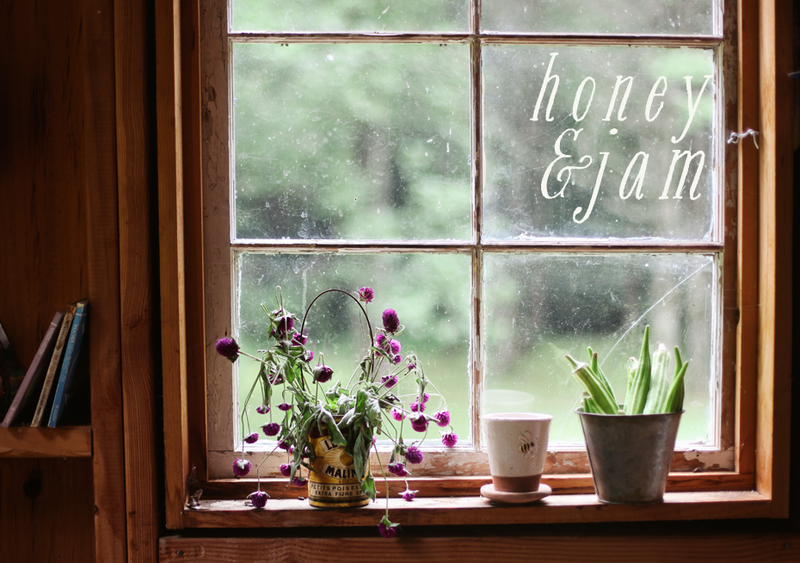 My friend Tammy from Simple Southern Happiness gave me a link to your blog. And I love it! I live in Kennesaw GA, am retired and have the same interest in cooking and photography that you do. I am going to add you to my sidebar so that I can see your new posts. Hi Hannah, I am new to your blog and love it! 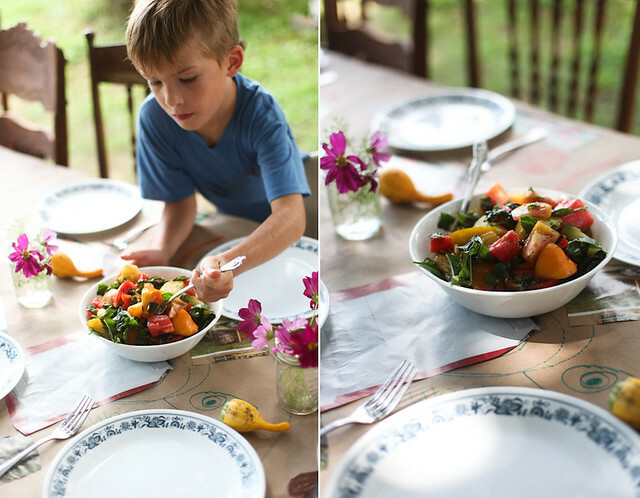 Beautiful photos, I love seeing children growing and cooking. The table looks so inviting. Every child should have an experience like this! 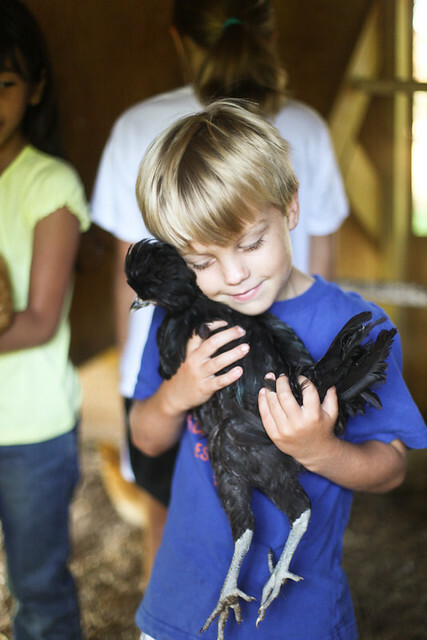 I especially adore the photo of the little boy hugging the chicken, so precious. Looking forward to be a frequent reader. If anyone is near central coast California I went to a farm-to-table place in the Santa Cruz mountains called Love Apple Farms. 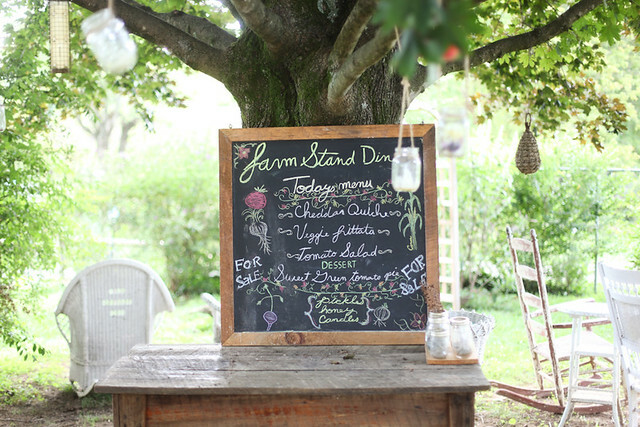 They hold really fabulous classes and just walking the grounds was a life changing experience in relationship to food. Wish there were more places like it. Oh I just get so lost in a happy place while looking at these photos! Wow! This is such a fun thing to do. A time to bond with the family. My family and I also do this when we we're little. It was a memorable experience. The kids are so adorable. 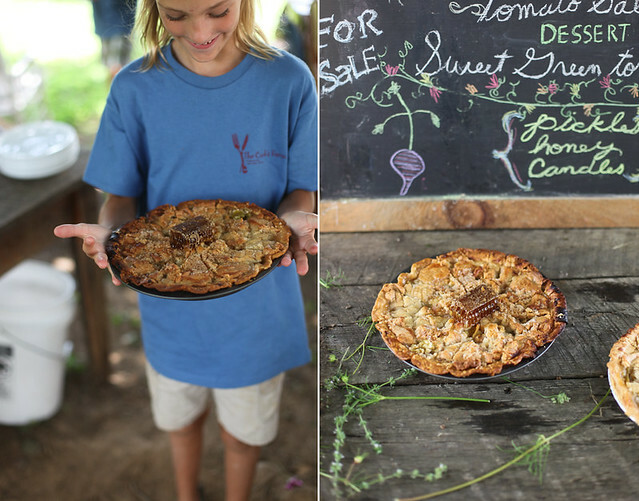 There is so much life in this post and that pie sounds YUM! Such a wonderful post! I love your pictures and you sure did have a great time at that farm. Love the recipe. Thanks for sharing! It's fun to see the kids engaged in this kind of activities rather than doing the usual...malling, eating at fast foods, playing video games etc. As I can see the kids are all having fun and learning at the same time. The kids are so adorable! but why are they all blonde? Don't you just LOVE this?! I co lead a garden to table program at one of my children's schools and it's remarkable to watch children and growing food. They are so excited (like the little man and the chicken in your pic!). What a beautiful experience and pictorial. Also appreciate the green tomato pie recipe since winter generally visits Colorado before all our tomatoes are ripe! What a fantastic project! I melted seeing the picture of the boy hugging the chicken close to him; so cute!! What a beautiful project for these kids! I love this idea, and wish I could have done something like this when I was little!! the "holding the chicken" photo is heartbreaking. What an incredible opportunity and experience. I am sure the kids will have those memories for the rest of their lives. What a fun time. You can feel the energy in the photos! The kids had a blast it seems, what a fantastic times these are. They will last in their memory forever! This was such a heart warming post. 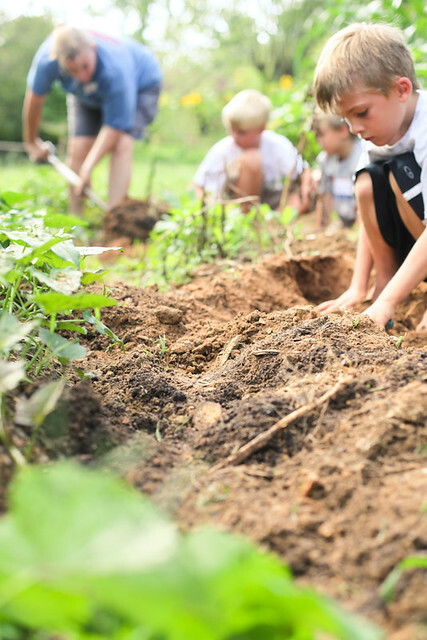 I remember going on so many homeschool field trips with my kids and they spent hours in gardens, streams, or woods... I just loved every bit of this article. What's the baking time on the pie? Such a beautiful post. The tender image of the little chap cuddling his chicken friend made me well up. So...I realize that I'm a bit late, but the recipe says, "In a large bowl, mix together the brown sugar, 1/2 cup granulated sugar, flour, cinnamon, salt, and pepper." However, I couldn't find pepper listed in the ingredients. Would you tell me how much pepper to use? Thanks in advance! I love green tomatoes, but have only ever had them fried. I can't wait to try this! This is very helpful information and it has significantly saved my time. I would like to say thanks a lot to giving a chance to all of us to comment to your precious post. Keep posting such an interesting Articles.